While Ford, Chevrolet, and Ram are the Big Three of Detroit, there’s another contender moving to town. The GMC Sierra 1500 is a full-size pickup with the offerings of a luxury pickup without the price. At the top of the line is the GMC Sierra 1500 Denali, a fully loaded luxury pickup. Brian Leon of the New York Daily News took the Sierra 1500 Denali for a spin and while you can read his review here, we have a few of the highlights. Boasting a large grille and chrome accents, the Sierra 1500 Denali is a hard truck to miss. Riding on 20-inch aluminum wheels, the pickup boasts plenty of leather surfacing on the interior. Large, comfortable seats make highway drives enjoyable and there’s plenty of space for stowing cargo. With enough room for four average-sized adults, the crew cab is more than large enough for a road trip. Ease of use makes driving this pickup truck a breeze, which is exactly what you get with automatic climate control. The control layout is easy to understand and everything is exactly where any driver would expect it to be. 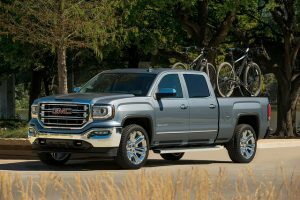 As for utility, the GMC Sierra 1500 Denali goes above and beyond. With a five-foot-eight-inch bed coming standard, transporting everything short of another truck is easy. When equipped with a 6.2L V8 engine, towing capacity comes to a maximum 9,200 lbs. With the available “Max Towing” package, that number jumps to 11,700 lbs. Here at Rivard Buick GMC, we have the latest GMC Sierra 1500 in stock and ready for a test drive!